The Five Tibetans are a series of yogic exercises brought to the West. The story I heard told is that there was a British army colonel based in the Himalayas who went to live in a monastery with the Tibetan lamas or monks. There Colonel Bradford (possible a pseudonym) was taught the Five Tibetans and the benefits were explained to him as follows: we have seven spinning psychic vortex that can be accessed through our physical body. Two are located in the brain, one at the base of the throat, one on the right side of the body in the vicinity of the liver, one in the reproductive anatomy, and one in each knee. As we grow older the spin rate of our vortex diminish and this results in ill health. What the Five Tibetans does - on one level of understanding - is to restore this spin rate to what it once was. Thus renewing vitality and vigour. When I practise the Five Tibetans daily I notice a marked decrease in my own irritability (I travel on public transport so I have a good measuring stick). I attribute this change to nerve strengthening. I also feel brighter and more 'pulled up'. This pulled up feeling could be explained by the vortexes. Teaching the Five Tibetans to clients has been interesting as well. People report feeling stronger, more energetic, more robust, and better able to cope. The additional feedback I get is that clients are happier. The Five Tibetans can be done in the morning and/or night. With practice the entire sequence takes less than 10 minutes. There are five Tibetans and after every Tibetan there is an interval breath. 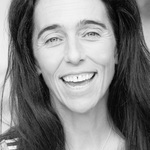 So, there are five interval breaths and at the end of the practice you can come into Sivasan. 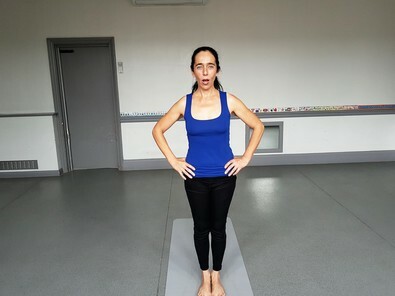 The interval breath is taken with hands on the hips, feet together, gaze straight ahead (or eyes closed) and the breath is in through the nose and out through the mouth, mouth held open in a medium-sized 'o'. You take this breath twice after every Tibetan (see pic). The first Tibetan is whirling and you whirl clockwise or to your right. The optimum number of whirls is 21 and it is fine to start with less. Extend your arms out to the side and spin and if you become dizzy slowdown or stop. With practice the dizziness disappears, the inner ear is re-balanced, negative residues are flung from the body and the chakra system is woken up. Also a bridge is built between the right and left hemispheres (following pic demonstrates mid-spin). Remember your interval breath. The second Tibetan is similar to western abdominal exercises except that we raise the head. By raising the head to the chest, we create extra effort for the solar plexus which in turn stimulates that major chakra. Keep your hands on the ground, your head lifted and raise straight legs together 21 times. 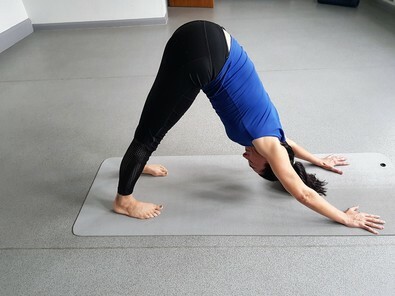 If this movement is too strong it can be modified by bending the knees and/or resting the head (see pic below for full version). After, take your interval breath. Tibetan number three opens the heart. Start by kneeling with arms alongside your body feeling long and straight. You then arc open and come into camel (see following pic). 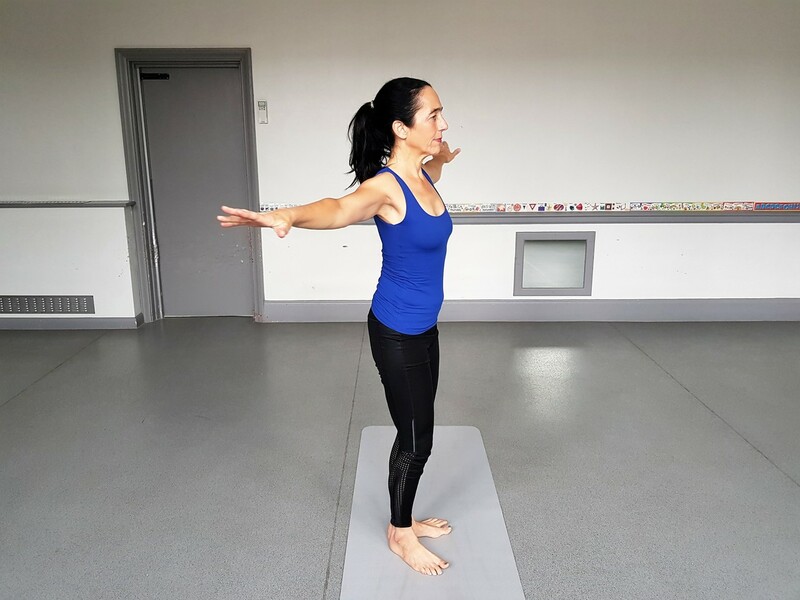 The arcing open should feel liberating - pull back if something is too much - and after arcing you return, then follow through to draw the chin powerfully into your chest. This powerful drawing in stimulates the thyroid. Go slowly for a full range of movement and 21 repetitions is the perfect amount. Standing up then for your two interval breaths. I describe Tibetan four as lifting and the benefits are great. Legs are strengthened, buttocks muscles are strengthened and the sacral area is stimulated front and back. 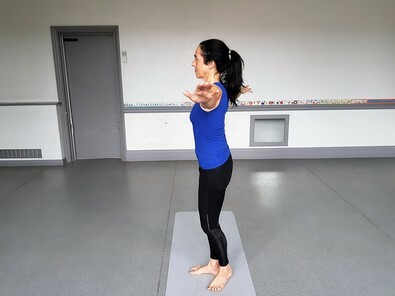 With arms alongside your body you lift into a tabletop and then lower down. Try to arrange your seated position so that arms remain straight throughout (see pic). Repeat 21 times and follow with the interval breath. Tibetan number five brings an immediate change in the energy currents of the body and once these movements are easily available 21 repetitions will leave you feeling happy and strong. This is the most powerful of all the exercises for speeding up the chakric vortexes. Basically, you transition from upward-facing dog to downward-facing dog and that transition counts as one. Repeat 21 times (see both postures illustrated below). Once you are done come to standing for your final interval breath. 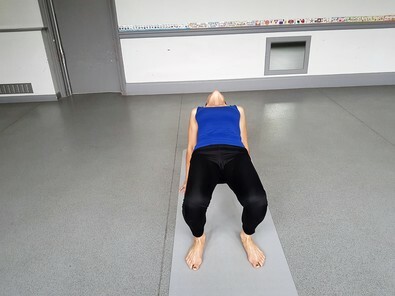 Sivasan is important to take at the end whenever you practice any yoga (see final picture), and even if your Sivasan is only several minutes please do go into it and drop. The restoration is very deep and we are most of us in need of dropping. If you can drop the mind as well as the body then here comes love, effortlessly.